Home > Bath > Soak to the Rescue! Comfort using kitchen cabinet ingredients – while it’s summer now, plenty of people still have aches and pains . Especially in cold weather this is so comforting – a rescue remedy for a Foot SOAK using inexpensive ingredients, you probably have in your home. I’m big on foot soaks, as if you are using essential oils – they enter the bloodstream and travel through the body within about 45 minutes- but if you don’t have essential oils – don’t worry you can still get great benefits with some Tea Bags, a little baking soda or corn starch, epsom salts (or sea salt). If you happen to have my Eucalyptus Spray – add 3/4 cap to the mix. Most important – water needs to be as hot as you can stand it. Use a tub where the water will cover the ankles- this is important as the sciatic nerve runs up the side of the ankle and carries the oils up thru the nerve. 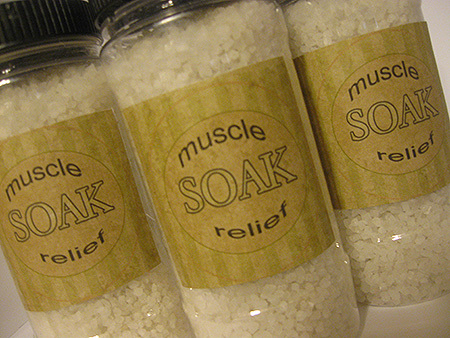 Poor the water over a cup of epsom salts per gallon, as it contains a large amount of magnesium, which is great for sore muscles and joints, as well as an anti-inflammatory. Add 2 or 3 tablespoons of of Baking Soda, which not only deodorizes the feet, but kills the bacteria that causes foot odor. If the kids have marbles, (probably not so likely these days) – dump in the bottom of the tub and rub your feet back and forth for relaxation. We all deserve to treat ourselves once in awhile – especially a cost effective way.